Shortly before I began compiling stories and stats for our first year-in-review payments report, our sponsor The Bancorp announced the launch of its own innovation lab, Cube8. This is significant and not just because The Bancorp is the largest issuer of prepaid cards in the U.S. and already partnering with the likes of Uber, Google and PayPal. Although it’s not the first payments leader to launch an innovation hub, The Bancorp’s decision to deepen its commitment to innovation is emblematic of a wider shift in the payments industry. We’re seeing substantial resources pouring into fintech. Following $19 billion in total funding in 2015, global fintech funding had hit $15 billion by mid-August 2016, according to BI Intelligence. While we await the final tally for 2016, perhaps more important than the financial investments is a shift in mindset to one of partnerships. Fintech companies and financial services firms will do better together than as adversaries. Plenty of companies out there still want to knock incumbents off their thrones, but many of the firms getting the biggest investments are the ones with plans to partner with financial institutions. A major theme I first encountered at Money20/20 Europe last April, and continued to hear echo throughout 2016 in into this year, was that fintech companies and financial services firms will do better together than as adversaries. Plenty of companies out there still want to knock incumbents off their thrones, but many of the firms getting the biggest investments are the ones with plans to partner with financial institutions. The exception may be in Europe, where regulators seem intent to increase competition and encourage new market entrants. The reason for partnering, however, is simple. Financial institutions or other large established players can offer distribution, scale, compliance and infrastructure. Meanwhile, financial institutions like The Bancorp are showing their own commitment not to defeat these upstarts, but to partner, support and invest in a collaborative future that enables the best of each group to grow while expanding the pool of electronic payments through creativity and, yes, technology. Whether it’s chatbots that help consumers manage their accounts, refrigerators that can make sure you don’t run out of milk, or a blockchain-based B2B payment, the future of payments and financial services is likely to include them all, as well as scenarios we can’t yet imagine. There will be false starts, flashes in the pan and regulatory roadblocks—and perhaps some tailwinds. 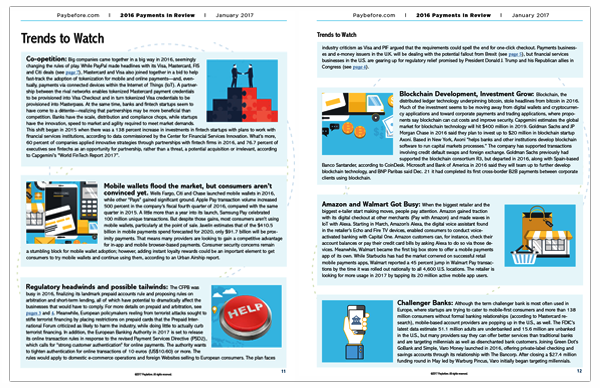 In our report, you’ll find the Top 10 Payments Stories from 2016, Trends to Watch and metrics throughout that point to what’s ahead. The companies that thrive in this new normal of experimentation and unimagined commerce experiences will be the ones investing in innovation now and always looking for ways to go one step further. We’re only six weeks into the New Year and already we’ve seen significant activity on the regulatory front in the U.S. and more to come in the U.K. and Europe. Meanwhile, many of the other trends we identified as ones to watch—bots, blockchain and co-opetition—have been dominating our Pay News headlines. If there are trends you’re watching, or participating in, that we’ve missed, let us know. And, if you want to keep up with our coverage, make sure you’re signed up for the free e-newsletters you want to receive, whether your focused on compliance, innovation or analysis, or all of the above. Loraine DeBonis is editor-in-chief of Paybefore. She’s been immersed in the payments industry for a decade, covering everything from prepaid in all its form to mobile wallets, financial inclusion and cross-border payments. Loraine also serves as the judging panel chair for the annual Pay Awards. Nominations for the 2017 competition are due March 10. Email Loraine with questions, comments or story ideas or call her at +1 708.983-2699. The right technology—the systems that encourage consumer loyalty and spending—do much more than speed up checkout. An expert explains why. California already has a way to protect consumers from predatory lending practices while also encouraging the kind of innovation that leads to increased access to responsible and affordable credit—especially for those most often left out of the financial mainstream. Did Apple Just Reinvent Retail Again? Forget facial scans or a watch that's not tethered to the phone. If you’re a bank or payments company, you'd best be looking at Apple's plans for the transformation of retail. A young woman has made plans to join a friend for dinner at a restaurant across town, and with a few clicks on a mobile device she sets her night in motion. Her go-to ride-sharing service has sent a car, she’s ordered a cappuccino from her favorite coffee shop – this one is free because she’s a loyalty member – and her social app pings her friend to let him know her ETA.